Download "New York Laws. 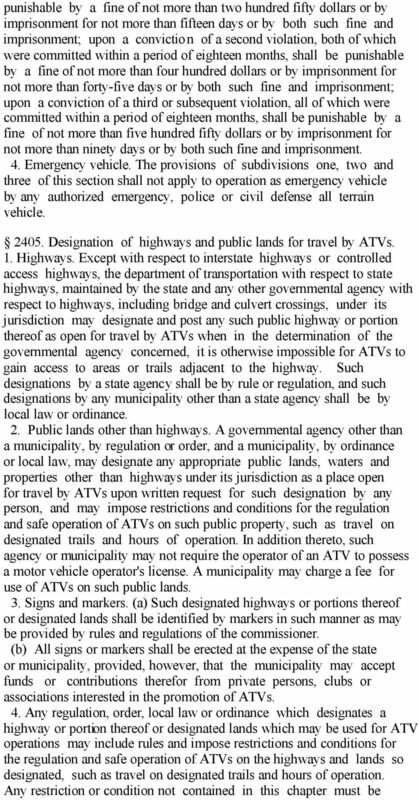 Title 11, ARTICLE 48-B REGISTRATION OF ALL TERRAIN VEHICLES"
2 fees shall not apply to dealers registered pursuant to section four hundred fifteen of this chapter. (g) Annual fees shall not be prorated and such fees shall be applicable to a year or any portion of a year. 4-a. Additional fee. 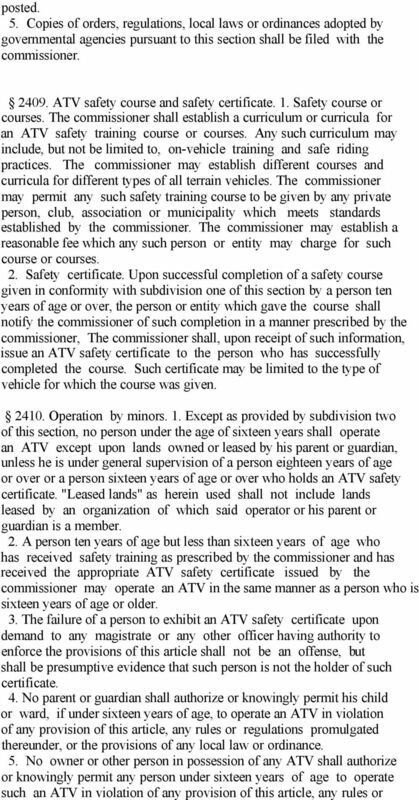 In addition to the fees provided for in paragraphs (a) and (b) of subdivision four of this section the commissioner shall, upon application in such cases for the registration of an all terrain vehicle or the renewal thereof, collect an additional fifteen dollar fee for each individual resident and nonresident registration. This fee shall also be collected from dealers at the time of original registration and at the time of each renewal. 5. Application. The owner of each ATV requiring registration under this section shall present an application for registration to the commissioner, on a blank to be prepared and furnished by the commissioner for that purpose. Such application shall contain or be accompanied by such evidence of the ownership of the ATV described in the application as may be required by the commissioner. 6. Dealers. 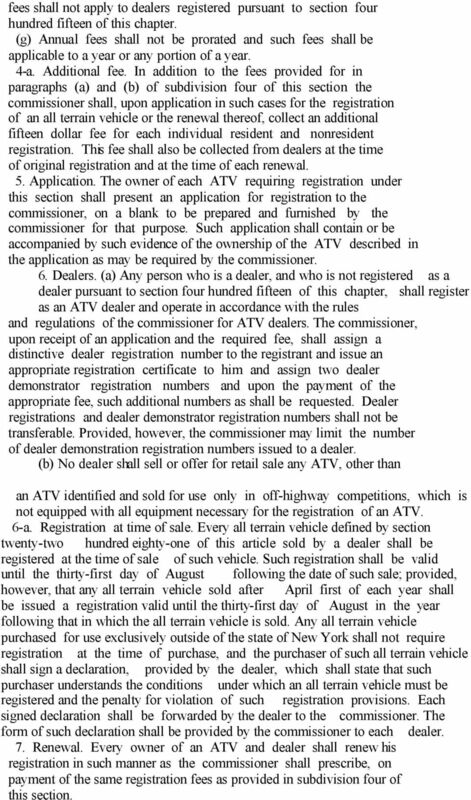 (a) Any person who is a dealer, and who is not registered as a dealer pursuant to section four hundred fifteen of this chapter, shall register as an ATV dealer and operate in accordance with the rules and regulations of the commissioner for ATV dealers. The commissioner, upon receipt of an application and the required fee, shall assign a distinctive dealer registration number to the registrant and issue an appropriate registration certificate to him and assign two dealer demonstrator registration numbers and upon the payment of the appropriate fee, such additional numbers as shall be requested. Dealer registrations and dealer demonstrator registration numbers shall not be transferable. Provided, however, the commissioner may limit the number of dealer demonstration registration numbers issued to a dealer. (b) No dealer shall sell or offer for retail sale any ATV, other than an ATV identified and sold for use only in off-highway competitions, which is not equipped with all equipment necessary for the registration of an ATV. 6-a. Registration at time of sale. Every all terrain vehicle defined by section twenty-two hundred eighty-one of this article sold by a dealer shall be registered at the time of sale of such vehicle. Such registration shall be valid until the thirty-first day of August following the date of such sale; provided, however, that any all terrain vehicle sold after April first of each year shall be issued a registration valid until the thirty-first day of August in the year following that in which the all terrain vehicle is sold. 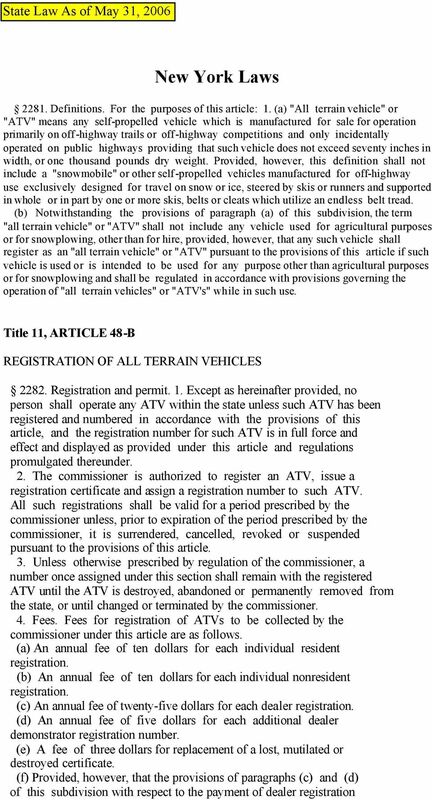 Any all terrain vehicle purchased for use exclusively outside of the state of New York shall not require registration at the time of purchase, and the purchaser of such all terrain vehicle shall sign a declaration, provided by the dealer, which shall state that such purchaser understands the conditions under which an all terrain vehicle must be registered and the penalty for violation of such registration provisions. Each signed declaration shall be forwarded by the dealer to the commissioner. The form of such declaration shall be provided by the commissioner to each dealer. 7. Renewal. 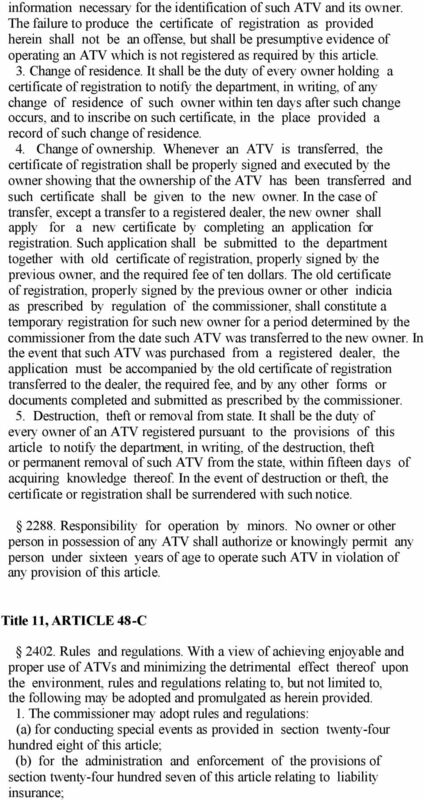 Every owner of an ATV and dealer shall renew his registration in such manner as the commissioner shall prescribe, on payment of the same registration fees as provided in subdivision four of this section. 8 regulations promulgated thereunder, or the provisions of any local law or ordinance Liability for negligence. Negligence in the use of operation of an ATV shall be attributable to the owner. 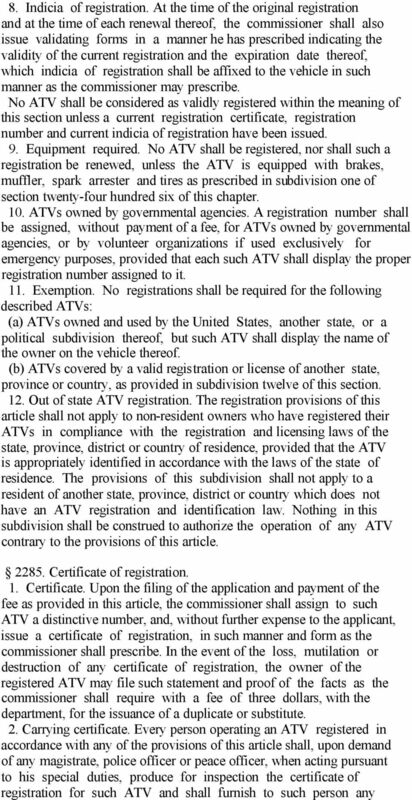 Every owner of an ATV used or operated in this state shall be liable and responsible for death or injury to person or damage to property resulting from negligence in the use or operation of such ATV by any person using or operating the same with the permission, express or implied, of such owner, provided, however, that such operator's negligence shall not be attributed to the owner as to any claim or cause of action accruing to the operator or his legal representative for such injuries or death Service on nonresidents and certain residents, administrators or executors. 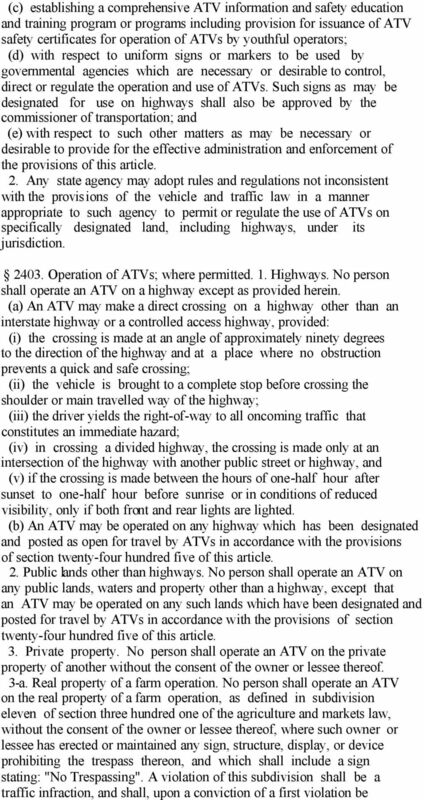 For the purposes of section two hundred fifty-two of this chapter, an ATV shall be a vehicle and the provisions of that section and section two hundred fifty-three of this chapter shall apply to ATVs Accidents; reports. 1. 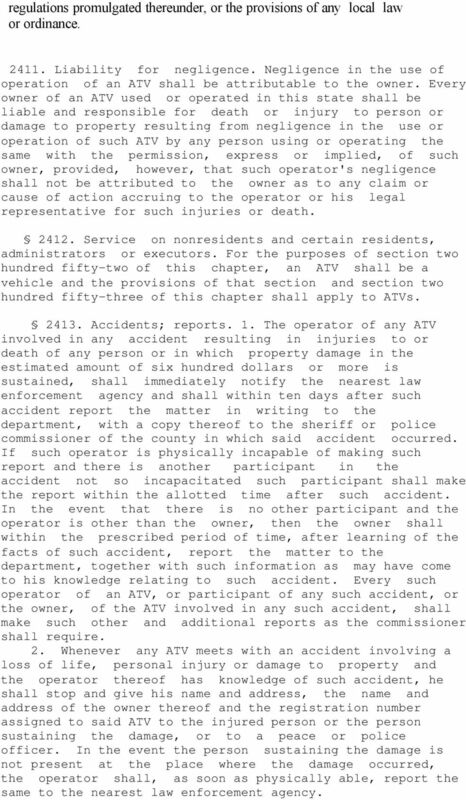 The operator of any ATV involved in any accident resulting in injuries to or death of any person or in which property damage in the estimated amount of six hundred dollars or more is sustained, shall immediately notify the nearest law enforcement agency and shall within ten days after such accident report the matter in writing to the department, with a copy thereof to the sheriff or police commissioner of the county in which said accident occurred. If such operator is physically incapable of making such report and there is another participant in the accident not so incapacitated such participant shall make the report within the allotted time after such accident. In the event that there is no other participant and the operator is other than the owner, then the owner shall within the prescribed period of time, after learning of the facts of such accident, report the matter to the department, together with such information as may have come to his knowledge relating to such accident. Every such operator of an ATV, or participant of any such accident, or the owner, of the ATV involved in any such accident, shall make such other and additional reports as the commissioner shall require. 2. Whenever any ATV meets with an accident involving a loss of life, personal injury or damage to property and the operator thereof has knowledge of such accident, he shall stop and give his name and address, the name and address of the owner thereof and the registration number assigned to said ATV to the injured person or the person sustaining the damage, or to a peace or police officer. In the event the person sustaining the damage is not present at the place where the damage occurred, the operator shall, as soon as physically able, report the same to the nearest law enforcement agency. 9 3. 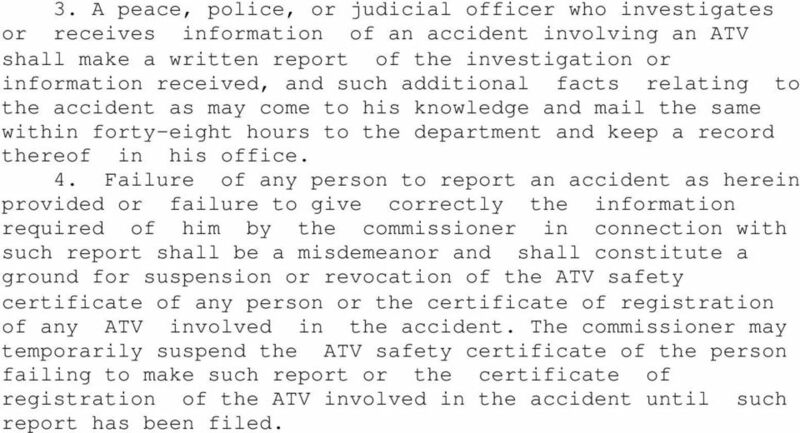 A peace, police, or judicial officer who investigates or receives information of an accident involving an ATV shall make a written report of the investigation or information received, and such additional facts relating to the accident as may come to his knowledge and mail the same within forty-eight hours to the department and keep a record thereof in his office. 4. Failure of any person to report an accident as herein provided or failure to give correctly the information required of him by the commissioner in connection with such report shall be a misdemeanor and shall constitute a ground for suspension or revocation of the ATV safety certificate of any person or the certificate of registration of any ATV involved in the accident. The commissioner may temporarily suspend the ATV safety certificate of the person failing to make such report or the certificate of registration of the ATV involved in the accident until such report has been filed. ARTICLE 705 Curfew. "Minor" shall mean and include any unmarried person under the age of eighteen (18) years. Limousine Law Relationship between NJMVC and Municipal Government The Fraud In 2008 MVC Clerks alerted the S & I Unit that hundreds of vehicles were being registered as limousines at the Newton Agency. 8.25.010 Title. This chapter shall be known as the alarm system control ordinance and shall be so cited and pleaded. [Ord. 1288 1, 2009. Chapter 8.25 ALARMS Effective August 1, 2013 8.25.010 Title. This chapter shall be known as the alarm system control ordinance and shall be so cited and pleaded. [Ord. 1288 1, 2009.] 8.25.020 Purpose.